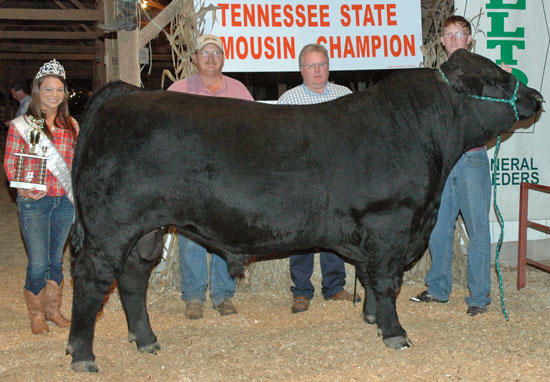 Pictured (L to R) are Bruce Steelman, Jim Dill, and Charles Steelman, being congratulated by the 2011 Warren County Fairest of the Fair, and Jim Dill, who served as judge of the event, on their winnings of Reserve Champion Bull; 3G Watchtower, at the 2011 Tennessee State Limousin show held recently at the Warren County Fair. The bull is owned by Charles and Paul Steelman both of whom have seen tremendous success in their 4-H beef projects. Congratulations to Charles and Paul and best wishes as they continue to exhibit their showstring of Limousin cattle and compete in the Tennessee 4-H Beef Project.